It is largely thought that as people age, their bodies produce less melatonin. 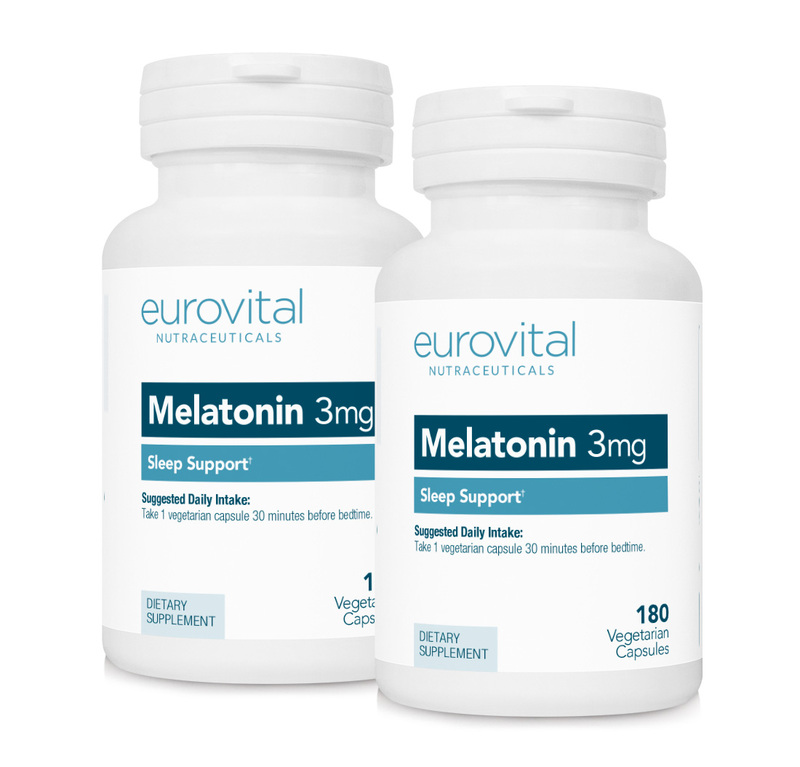 The production of melatonin varies according to the amount of light you're exposed to; more melatonin is produced at night than during the day, and your body produces more melatonin in a completely dark room than in a dimly lit one. Stress, illness, and ageing are often the culprits that can speed up this deficiency in Melatonin. Most people report a calm deep sleep; some report more dreams and also a good nights rest. Other Ingredients: Microcrystalline cellulose, gelatin, silica, vegetable magnesium stearate. I love this product as it allows me to have a restful sleep without any side affects the next day. On some nights, I need to rise from bed in a hurry but this product does not affect my concentration or performance in my duties. Melatonin, for me, has been a Godsend. I'm 25 years old and have suffered insomnia my entire life, even as a young child. I think it's at least partially genetic as my father and paternal grandmother have much the same problem. It would take me several hours to fall asleep meaning I'd get 5-6 hours sleep on a good day and as little as 2 hours sleep on a bad day. By the time I was 19 I had tried everything: herbal supplements, OTC remedies, antihistamines, exercise, diet changes, hypnosis and everybody's suggestions of things such as milk, honeycomb and lavender. I went through a fairly concerning several months where I was drinking up to two bottles of wine a night because it was the only way I could MAKE myself sleep. Not wanting to develop an alcohol problem I saw my GP about my Insomnia. After extensive testing and re-trying over-the-counter products I was prescribed diazepam. It worked like a miracle, but unfortunately it is very addictive so Doctors very very rarely prescribe it for more than 2 weeks and only then in severe cases. I was then given a similar drug called Zopiclone, which worked perfectly. Although I didn't feel myself developing a rapid tolerance as I did with diazepam, my doctor apologized and told me that it, too, was only approved for short-term use. I tried Melatonin just because it is natural (and to be honest, it was on sale haha). I have been taking Melatonin every night for 8 months now and have had only 4 sleepless nights that whole time. I do need to take 3 instead of "1 or 2" but other than that if I take it an hour or so before bed, I find I drift off within half an hour and feel much more rested in the mornings. I've lost weight, I have more energy, I am happier and more social and my quality of life has hugely improved. I cannot recommend this product strongly enough to anyone struggling with sleep. I would suggest talking to your GP about it first as problems sleeping can often by a symptom of an underlying condition and it's always best to be safe. While Melatonin is excellent for helping you to fall asleep, and will reduce - but not stop - the number of night-time awakenings, it does not improve the length of sleep so is generally not advisable if you have "early morning awakening insomnia". Have used for years, very good, no problems, great service. After being given a book called "The Melatonin Miracle", by a friend, I needed to find a supply. Living in the UK it is not available to purchase & can only be obtained by prescription. I then browsed the net & discovered BIOVEA. I have not looked back since! The product arrived from the United States in under a week! I have been taking 1 tablet a night ever since & have noticed improvement with my eye sight, breathing, sleeping & general well being. I definitely, highly recommend this product & as the service that BIOVEA provides, has been totally excellent, there is no need to look else where. Please be aware that I do not usually fill in reviews, but this product is so good that people need to know about it! If one person reads this review & tries this product with the success that I have had with it, then that would be fantastic! Don't take my word for it, give it a go & allow time for it to work! Tony Leese. UK. I am so glad my psychiatrist got me on to Melatonin 3mg capsules, they have made a great difference to my sleep patterns and I remain calmer now. Thank you for asking, I've been using MELATONIN Tablets for 4-5 Years and I was happy with the immediate action of the Tablets, this is the first time that I've bought the Value Pack Capsules, as I couldn't find the Tablets on line ? The price is great, but to have to take it 30 minutes, or so before retiring, I find a bit restrictive as it's not easy to get the timing right at times and get sleepy too soon, or not soon enough. I also really liked and used the MELATONIN Orange Flavor Bilingual Liquid, that I would give 5 Stars !!! which I've found excellent !!! I hope that BIOVEA will make it available again as it's in my opinion better than the Tablets or the Capsules, though if that's the only product available I have no choice, but to have the Capsules. I do suffer from PTSD from my Military Service and as I don't want to take drugs like (Valium,or Normison) I choose to take the Natural product of now the, MELATONIN 3mg Capsules. Thank you BIOVEA with your help I have some better sleep !!! Melatonin helps my husband fall asleep, but does not help being asleep for too long. Keeps the insomnia at bay. Finally a restful sleep! Gret value works for sure. Never slept better just drop of to sleep.